High Density Ammonium Nitrate (HDAN) and Calcium Ammonium Nitrate (CAN) are nitrogenous dry fertilizer products. HDAN is differentiated from Low Density Ammonium Nitrate (LDAN), which is a grade used primarily in explosive applications and is sometimes referred to as Industrial Grade AN. Ammonium nitrate is considered the most effective, rapid and efficient form of nitrogen (N) fertilizer because other types of N fertilizers must undergo a conversion to the nitrate form of N in the soil before plant uptake can occur. Ammonium nitrate fertilizer is also more resistant than other nitrogenous fertilizers to loss of N content to the atmosphere. Ammonium nitrate is produced starting with a simple reaction of anhydrous ammonia and nitric acid. For solid form AN, the resulting liquid is concentrated and processed into prills, granules or crystals. 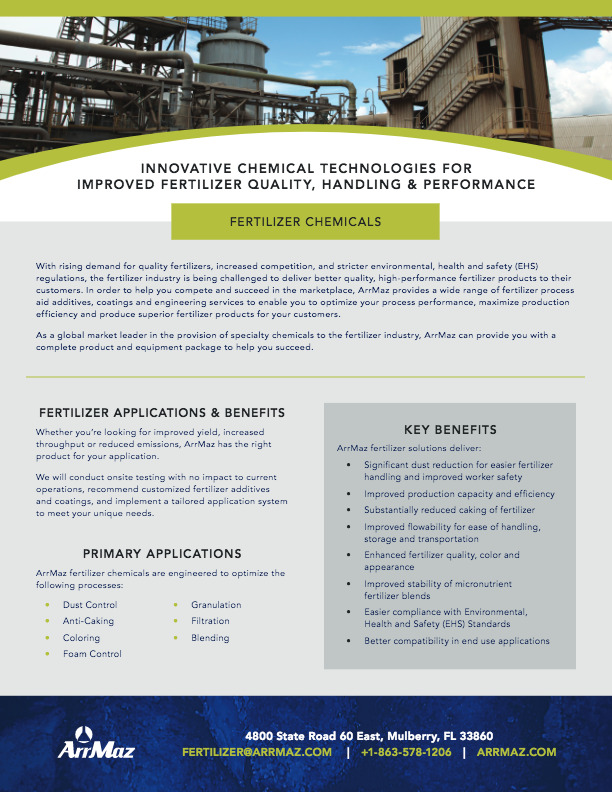 Concentrated AN solutions can also be used to produce urea-ammonium nitrate solutions (UAN) used in liquid fertilizer systems. CAN is produced by mixing the concentrated AN solution with some form of ground calcite material and then prilled or granulated. Both products are important agricultural inputs which are either directly applied to the soil or used as components in bulk blended or compound NPK fertilizers. AN does have some drawbacks – it is a strong oxidizer and can explode under certain conditions, so there are restrictive regulations on its handling and use in some countries. Another challenge for AN in both these forms is that it is quite hygroscopic and has a critical relative humidity much lower than other fertilizers. Therefore, the propensity of these products to cake is very high and must be controlled with an anticaking treatment. ArrMaz is the world leader in the supply of coatings for HDAN and CAN fertilizers with products from its GALORYL® line of specialty anti-caking coatings. Formulations are customized for individual operational parameters and end-use requirements.